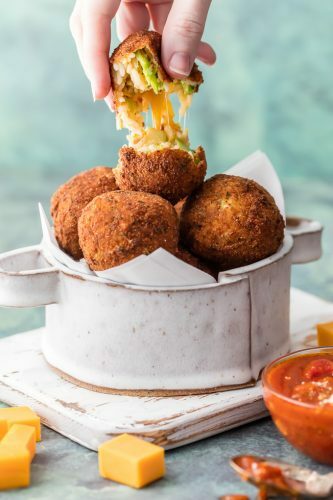 This Bacon Broccoli Cheese Arancini is a fun and unique appetizer fit for starting any delicious meal at home. Much easier than you would think and bursting with flavor. 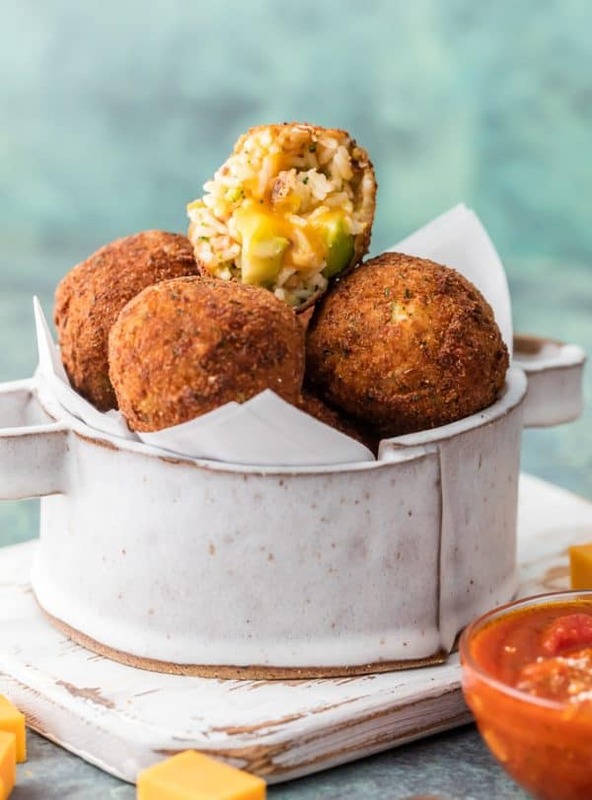 If you haven’t heard of arancini, don’t feel bad! You’re not alone. 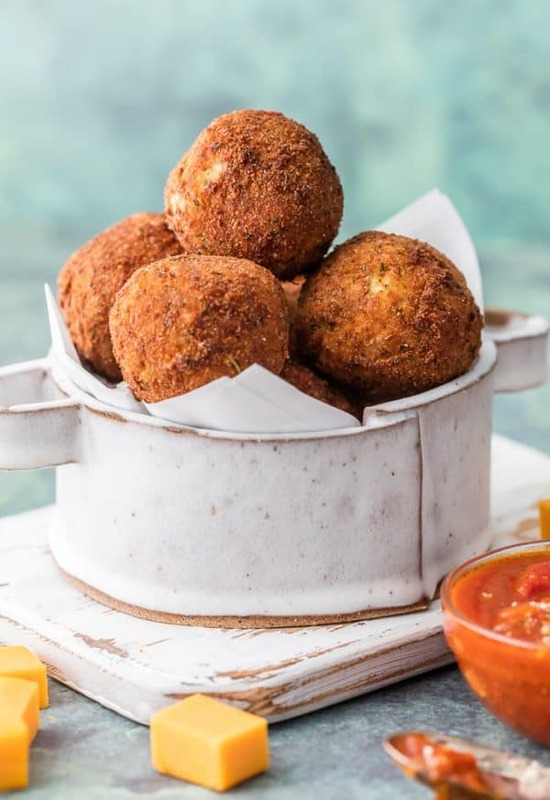 I recently was at one of my favorite restaurants and saw “arancini” listed on the appetizer menu and of course had to google it to find out exactly what it was. Basically it’s a rice ball deep fried…almost like a fried meatball made of rice. We ordered them OF COURSE and I was instantly in love. I could have eaten them for our entire meal. When I got home, I knew I had to try to make them on my own, but wanted to get a little creative with the recipe. I decided to make Bacon Broccoli Cheese Arancini, and I wasn’t disappointed. The flavors of bacon, broccoli, and sharp cheddar really shine in these warm and toasty treats. These little fried beauties come together much easier than you might think. You just need some bacon crumbles, cubed cheddar, cooked rice, and frozen broccoli in cheese sauce. We like to keep things simple around here. They’re delicious on their own or dipped in fresh marinara sauce. I love them as an appetizer, but like I said before they’re fit for a main course as well. You better make extra, they are gone pretty quick at our house. 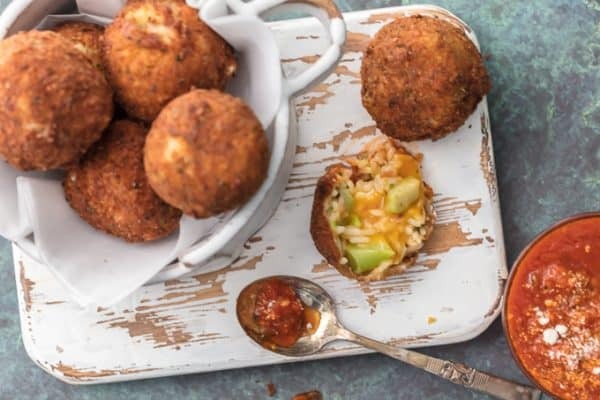 If you already knew what arancini was, I hope you try this Bacon Broccoli Cheese version. If you didn’t, you definitely have to try it! You’ll be addicted. In a large bowl stir together the rice, bacon, and broccoli/cheese. Leave the cubed cheese separate. Place in the fridge to chill enough to be able to handle. Place flour, eggs, and bread crumbs into three separate small bowls. Once rice mixture is chilled, take a small amount and add a cube of cheese to the middle. Keeping the cheese in the middle, top with more rice to create a ball, approximately 2 inches in size. Press together firmly to make sure it holds its shape. Dip into the flour and coat completely. Next coat in egg, using a fork to allow the excess to shake off, then dredge in the bread crumbs, coating completely. lay on a plate and repeat with the rest of the rice. For me I was able to make about 12 balls. You can make whatever size you'd like. Heat 3 inches of canola oil in a large stockpot or dutch oven to 350F. Once hot, cook the rice balls in batches until fully browned, approximately 1-2 minutes each. 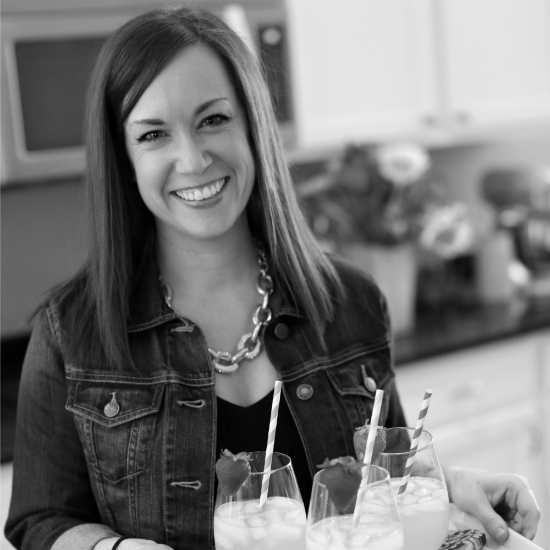 wow, what a fun recipe, thank you for this, alread love broccoli and cheese so I appreciate a different twist on that recipe! How can we use fresh broccoli? Love to try and keep organic.